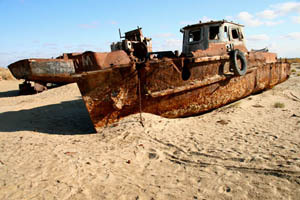 The Aral Sea has been steadily shrinking, especially since the 1960's due to the diversion of the rivers that flow into it by the former Soviet Union. The situation is so bad that in some places, the shoreline has recede more than 100km from where it used to be. 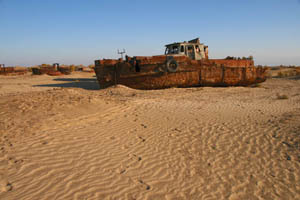 Fishing villages now lie in barren desert wasteland and the fish stocks are gone. Frequent dust storms carry polluted, toxic dust across the region and the local climate has even shifted without the water's moderating properties resulting in scorchingly hot summers and brutally cold winters. It sounded like an interesting place to see where man has interfered with the course of nature so I just had to go there. 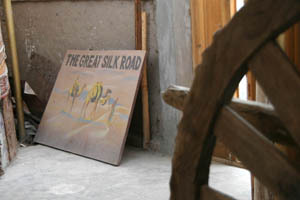 Uzbekistan was once a major part of the famous Silk Road, linking Europe with the Far East. 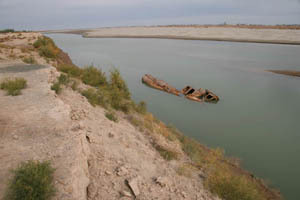 An irrigation canal with a ship rusting away in it. 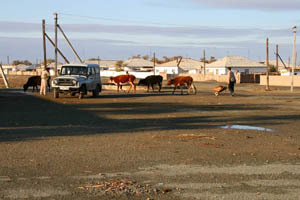 The town of Muynak. 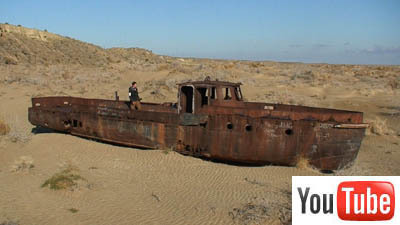 A once proud fishing center, it now lies in a vast desert, 130 km away from the Aral sea's waters. 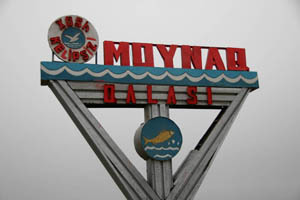 The sea floor near Muynak. 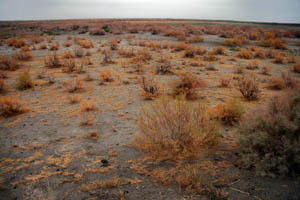 The shrubs have been planted by the government to help keep the sand from blowing around during dust storms. 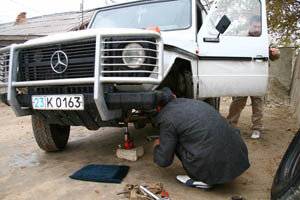 Some final repairs to one of our off road vehicles before we proceed any farther. 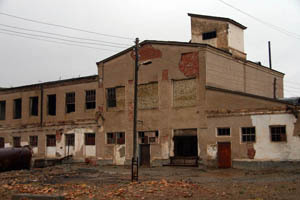 The former fish cannery. It is now a decaying shell of what it once was. 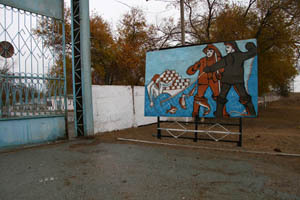 The placard outside the fish cannery still shows fishermen working the sea. 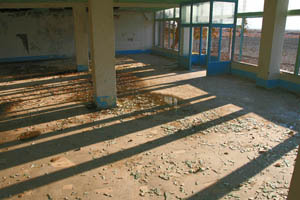 Inside the cannery. This area used to have vast stocks of fish but the steady decline in water levels means that not only are the fish gone... The sea is gone too. 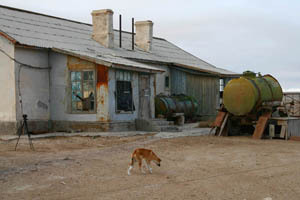 The airport terminal in Muynak. Workers used to fly in regularly to work the fisheries while the fresh product was flown to Russia and beyond. 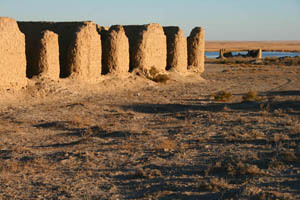 Scenic Muynak, near the airport. 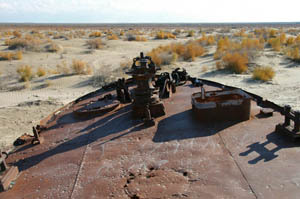 The ship cemetery of Muynak. 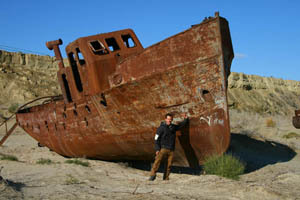 Here, old rusting ships lie in the sand where the Aral Sea used to be. 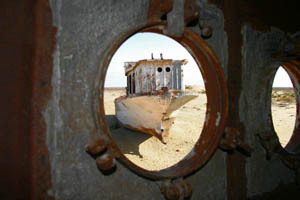 The true "ships of the desert"
There used to be hundreds of these ghost ships but most have been scavenged for scrap metal. Few still remain. 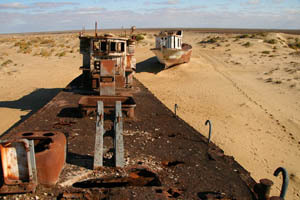 These ships are the most dramatic example of the Aral Sea catastrophe. Permission to come aboard sir? 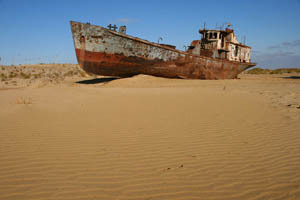 The water management was (and is still) so poor that the sea continues to shrink even today. 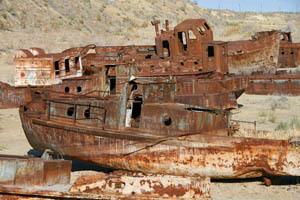 A once proud fishing fleet, reduced to rust. The view through one of the portholes. 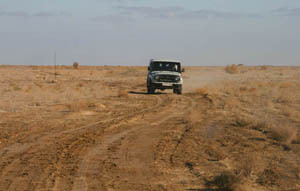 From here, our plan was to drive into the desert to see how far the water had receded. 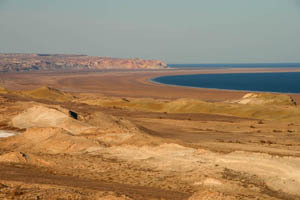 We had to drive 130 km across old sea floor before we caught our first glimpse of water. There it is... 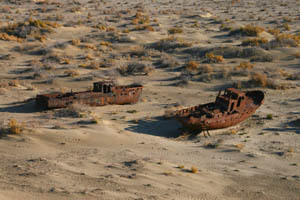 The Aral Sea. It has lost over half its surface area and over 85% of its water volume. 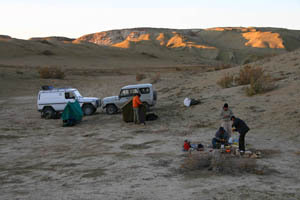 Our campsite on the ridge, overlooking the sea. Night time temperatures dropped to below freezing. 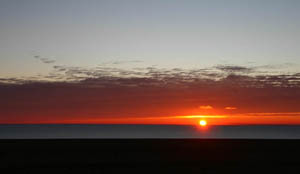 The Aral Sea at sunrise, somewhere near the Kazakhstan border. 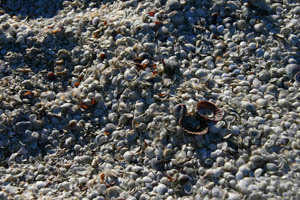 Seashells scattered about near the current shoreline. 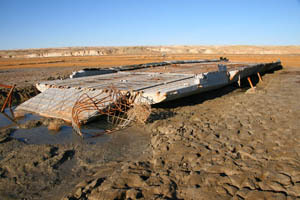 Two months previous, this barge had been floating in the water. Now it sits in the mud about 90 feet from the sea. 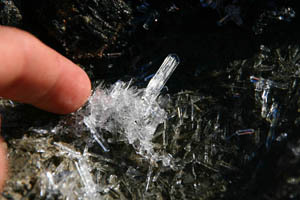 Salt crystals. As the sea evaporates, it becomes more saline. 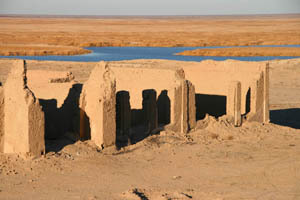 The Aral used to be the 4th largest inland freshwater sea. 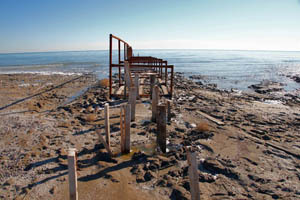 A makeshift dock installed by an oil exploration company. Most of it is above water now. 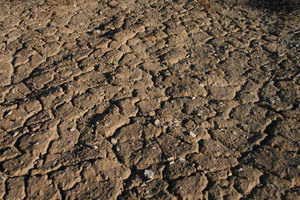 The dry, cracked sea bed. 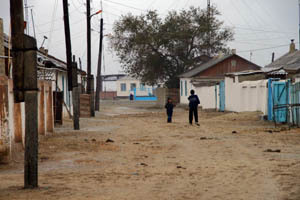 A former remote fishing village. Only a small irrigated lake remains nearby. We met only 2 fishermen who still are working in the region. We spent one night in this old former Soviet radio transmitting station, drinking vodka with the two workers there, surrounded by old CCCP maps. 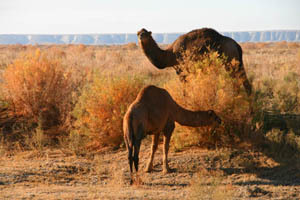 Camels wandering the Aral Sea. 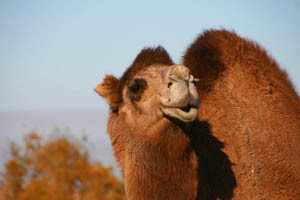 What was once a sea is now a desert, inhabited by camels.